Latex mattress topper for hip bursitis. Home → Mattress Protectors → Danican Waterproof Mattress Protector → Latex mattress topper for hip bursitis. I’m a 54 year old male 5’4″ 135 pounds – bilateral hip bursitis. Have memory foam toppers (old now) and hips hurt. Use valium and NSAIDs at nite but still don’t get good sleep. Side sleeper. Start with worse hip on top and get about 3-5 hours on good hip before turning over onto worse hip and getting about 2 hours at most. Doing physical therapy but need to be well rested. Latex sounds like a possibility. Would appreciate your thoughts. All natural Latex foam rubber is nothing like you’ve experienced thus far. Latex is, by far, better than memory foam, in every respect. If you can imagine what it’s like to substitute the best upholstery material that has ever been, to the worst ever invented, you may be able to imagine the difference between what works and what hasn’t. 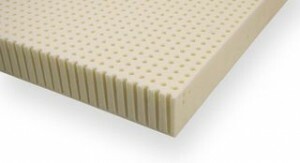 2″ of soft Talalay latex is all you’ll need. I’m betting that you’ll be able to back off of the Valium as an every day thing. Here’s the link where can get one. Delivery is free and there’s no sales tax. Protect your mattress from accidents, spills & perspiration with our all natural silver infused cotton waterproof mattress & pillow protectors. They sleep cool and won’t shrink when washed in hot water.